Donald Trump wants to spend more and tax less, but total debt in the US is already approaching $20 trillion dollars, and the debt ceiling is also approaching. Donald Trump has a lot of plans: more defense spending, tax cuts for corporations and individuals, build a wall, a $1 trillion infrastructure program,... The Dow Jones has been rising since Trump was elected, but this may be the greatest sucker rally of all time. The question we should ask is how Donald Trump is going to find all the money to finance his proposals. And to make things even worse: as of March 16, 2017 the outstanding debt of the US will be at the statutory limit. According to US laws, the government can only borrow money to a certain amount, which is called the debt ceiling. 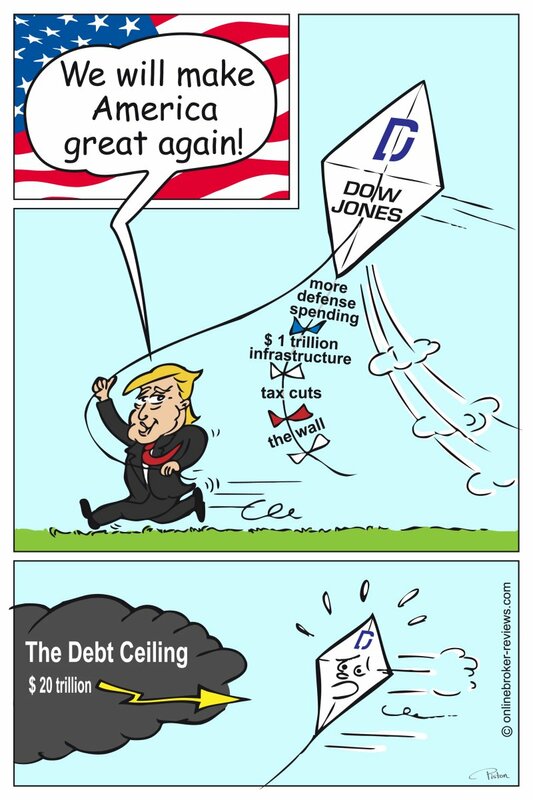 The debt ceiling has been raised numerous times in the past and it will be interesting to see what will happen in the coming weeks and months. Most Republicans have always been opposed to raising the debt limit.